Octodad: Dadliest Catch is an independent adventure video game developed and published by Young Horses. It is a sequel to the 2010 freeware game Octodad. The game consists of controlling the protagonist Octodad in completing chores typical of the mundane suburban father, but complicated by the fact that he is an octopus in disguise. Octodad: Dadliest Catch requires the player to control the protagonist, Octodad, as he maneuvers his way through increasingly complex challenges all while attempting to hide the fact that he is a cephalopod in human clothing. The player can control one of two sets of tentacles, mimicking arms and legs, switching between the two with a single button. The player is able to pick up and throw loose items as well, through manipulation of these tentacles. To maintain Octodad's identity, the player must avoid causing too much chaos in moving the character around while in sight of certain non-player characters, like guards or scientists, as tracked by a gauge in the game; how quickly these characters catch on is set by the game's difficulty level. If the gauge becomes full, the player will be forced to restart at a recent checkpoint. The game is divided into several levels with various objectives to be completed to progress in a level. For example, in a supermarket, the player must collect several grocery items before being given their next task. A multiplayer co-op mode is also available where up to four players control four limbs. The original Octodad was developed by a team of DePaul University game design students as an extracurricular activity. Following their graduation in 2011, eight of the original team of eighteen decided to pursue a sequel as a commercial project, and together with a new external member, formed the company Young Horses. Members of the original student team who did not join Young Horses signed over the rights to Octodad in return for company stock and a share of the sequel's royalties. Young Horses launched a Kickstarter crowdfunding campaign to finance a sequel, originally titled Octodad 2. Their campaign was successful and they raised US$24,320 in August 2011. Though the original Kickstarter campaign aimed to have the game released in 2012, the game did not release until January 2014, under the name Octodad: Dadliest Catch. The development time for the game was 2 years and 7 months. Additional free downloadable content, titled "Octodad Shorts", were released on October 14, 2014. 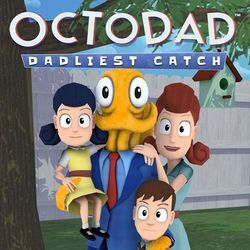 Set after the events of the original game, Dadliest Catch features Octodad working around the house, going grocery shopping, and accompanying his family on a visit to the local aquarium at his wife Scarlet's request, much to his chagrin. As before, he must spend time with his wife and children while not arousing the suspicion of other humans, including the evil Chef Fujimoto, who knows Octodad's secret and seeks to expose and cook him. Two bonus chapters were released under the name "Octodad Shorts". These include a flashback recounting Octodad and Scarlet's first date, and Octodad working in a hospital. This page was last edited on 30 December 2018, at 01:53.